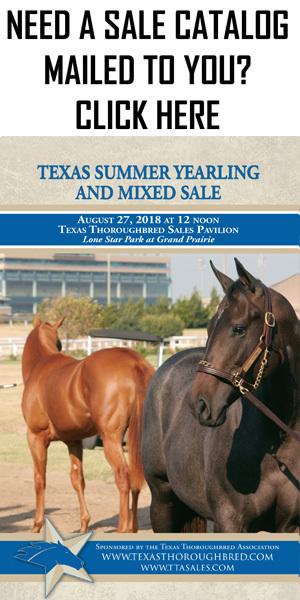 After four fillies tied for the fastest time during Sunday’s under tack show at Lone Star Park, fillies again took center stage in Wednesday’s Texas 2-Year-Olds in Training Sale with the five highest prices. The auction, sponsored by the Texas Thoroughbred Association and Lone Star Park, was held at the Dallas-area track. From 110 horses going through the ring, 75 head sold for a total of $1,751,400. The median was $14,500, up 10.69% from last year’s $13,100, and the average dipped 9.27% from $25,737 to $23,352. Buy-backs at this year’s sale came in at 31.82% compared to 20.75% last year when 84 of 106 head sold for a total of $2,161,900. Hip 21, a daughter of Street Boss who worked an eighth-mile in :10.3 in Sunday’s under tack show, topped the sale with a $150,000 bid from Maui James. Consigned by Asmussen Horse Center, agent, the unnamed Kentucky-bred is the first foal out of the winning Successful Appeal mare I Have a Price. Maui James was the leading buyer with two purchases for $203,000 with Danny Keene ranking second with four bought for $171,000. The second-highest price was for hip 131, All in Harmony. The Kentucky-bred filly by Palace Malice went for $140,000 to Carl R. Moore Management LLC from the consignment of Twin Oaks Training Center LLC, agent. She is out of the Tale of the Cat mare Cativating and worked a furlong in :10.3. The highest-priced male, and sixth-highest overall, was hip 129. 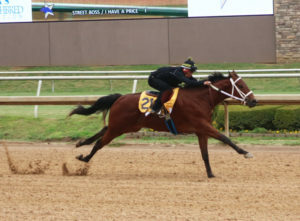 The Oklahoma-bred colt named Duffield and sired by Kennedy sold for $62,000 from Bryan Ford, agent, to John James. For complete results in the interactive catalog, click here. Or to view the results as a PDF, click here. This entry was posted in 2-Year-Old Sale. Bookmark the permalink.